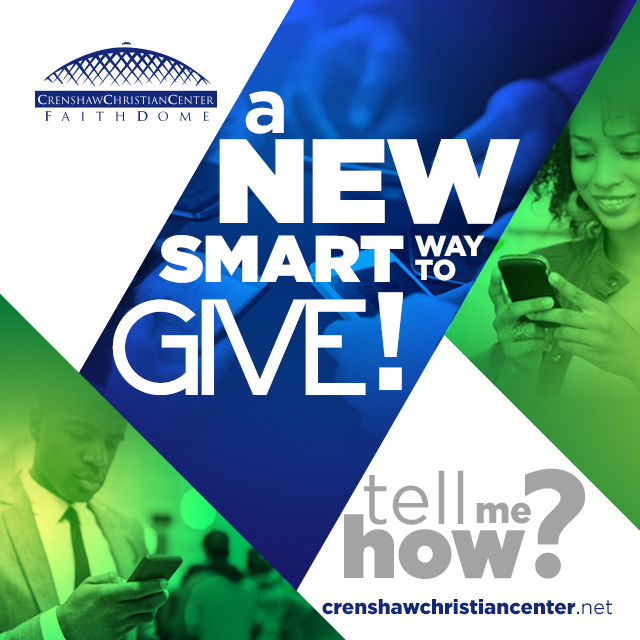 Crenshaw Christian Center added a NEW, EASY and SMART way to give. You can now text a gift any time to 28950. Simply type CCCG with any amount you wish to give, 10, 20, 75, 100, etc. and if itâ€™s the first time, you will be asked to register. The process is simple, secure and you do not incur a fee. When you give to Crenshaw Christian Center it helps fund life-changing projects that are having an eternal impact on peopleâ€™s lives. Your gift supports this global ministry as well as day-to-day operations that wouldnâ€™t be possible otherwise. Thank you for your faithful support through SMART GIVING. We commit ourselves to an ongoing effort to make giving a smooth, easy process while protecting your information.